"How are they doing?" Famous words said by every parent, ever thought why? This got me thinking: Even though, I knew my philosophy on this and yet I still wanted to ask those dreaded words. Why? Because I truly wanted to know how she was doing? Its been an interesting phenomenon having my daughter enter the world of school. I mean I know how she reacts at home, I know how she learns and yet when she is off in a different time and space then I wonder how she truly is doing? Million questions run through my mind: How is she behaving? What is she learning? How can I help at home to make it smoother? etc. Its a lot of stress and anxiety to have. As a parent all you want is the best for your child and I know that teachers will always give their best for my daughter but I also know its a very difficult job. I also know my daughter and I really just want to help. And lately this has gotten me thinking about my own students and their parents. What do they feel like when they drop their children off at school? Are they wondering about the same types of things (most likely yes). Now I know that we as teachers will often have interviews for students of concern or with parents we need to talk to, or we often see parents outside on the playground and say hey they had a great day but I know from experience that this doesn’t really alleviate the stress of wondering what your child is actually going through every day. 1) continue using twitter and storify in the classroom. In know that in previous post I have talked about this but these are amazing tools to have the parents see into the classroom. However, they don’t necessarily give a picture of a particular child’s strengths and next steps; just what they did and lately questions that can help with home. 2) So here is my insane idea, monthly summaries for each student. Now I know many of you are thinking that this means more work for you as a teacher but I don’t want to write them just give time for them to be completed. My biggest concern as a parent is what is she working on, and how can I help at school. Having these monthly reports would be, at least in my opinion, a great way of communicating this. This also will coincide with our schools philosophy of goal setting and making those goals public. Now I am also about not making more work then what is needed. I have a new born and my own daughter that I want to spend time with. I mean as we speak I am writing this blog as my daughter is having a bath. So how can we make this work? Conferencing has been always been an important part of my teaching but even more so now. My goal is always to meet with the students four times a month. During these meetings we discuss: reading goals, reading levels, math strategies, next steps, and classroom questions. My thinking is that we turn these conferences back on the students and once a month we write down what we worked on this month, what our reading level is, where we would like to be and what our next steps are. I was also thinking of adding in a parent connection where I can or students write what they would like to see at home. 3) I want to send home weekly good news. I hear this all the time in other amazing classes and I keep saying that I am going to do this but I really will now. Every week I want to send home five good news tickets, telling parents what amazing things that their child has done. Doesn’t have to be academic just something that they can be proud of. Now this may be a little more work but I think it would be worth it to build that community and trust. 4) Quarterly classroom visits: Now this is something that we already do. Twice a term I want to invite the parents into the classroom during the day so their child can talk to them about what they are learning. This will primarily be on #geniushour but it can also be on any other topic. I have learned more and more how important this connection is between the teacher and parent. As my daughter starts her career in school, I and my wife just want to be a part of it. She is our child and all we want is success. Creating this team dynamic will only help her’s and our student’s success. Now this is a work in progress I am not too sure if it is logistically sound but I think it will work. What do you think? Have you experienced this personally? What do you do in the classroom to communicate with all of the parents not just the ones that struggle? 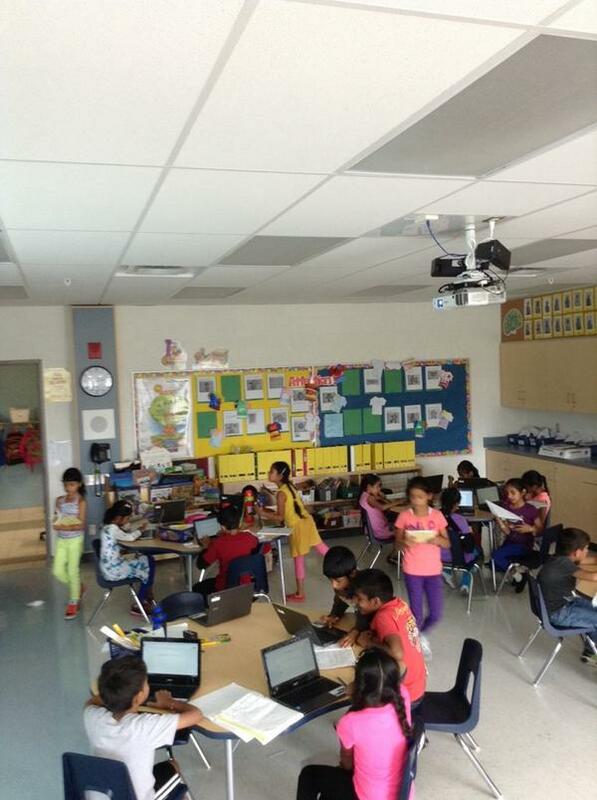 Author MrSoClassroomPosted on September 22, 2014 Categories communication, http://schemas.google.com/blogger/2008/kind#post, parents, teachingLeave a comment on "How are they doing?" Famous words said by every parent, ever thought why? This post is not so much a post about my thoughts but that of my colleague and close friend Keri Ewart (@KeriEwart). Today she was on a Hamilton Radio station discussing technology in the classroom. 1) Its not the iPad per-say but what the teacher does with it. You cannot just plop a device into a child’s hand and say learn. They may but most likely will not. 3) Kids love it and therefore will stay more engaged with it. 1) Are the iPads meeting all kinds of minds? I am all about tech and use it quite easily but what if a child could care less? 2) How do we families and students who don’t have exposure to tech while stimulating those who do? 3) What about those who cannot afford it? 4) What is needed for all teachers to critically think about implementing technology in the classroom? 5) How does everyone else use technology in the classroom? How do you seamlessly integrate it into your program? What programs do you use and why? Love to hear your comments and thoughts. I recently came upon a post by my friend Aviva (@avivaloca). In her blog (http://bit.ly/1zZi78y) she was reflecting on teaching through inquiry. I started to respond in her comments but was thinking of so much more to write. In fact it even made me split the blog post into two posts for sake of space and time for readers. This is the second part which in my opinion focuses more on the teaching parts of Inquiry. The first focuses on the planing portions. Though to be fair they often blur together. How does this impact on classroom design? What role will students play in this design? How does this impact on scheduling and specialist teachers? If students are on rotary, I wonder how the teachers can work together to create longer blocks of learning time even when they don’t naturally exist. How do we improve our questioning skills? How do we get comfortable with “wondering,” and not always having the answer in mind? How do we get better at understanding curriculum expectations and seeing the links between expectations? How do we balance “student interests” and “curriculum expectations?” What does this balance look like? How are teachers supported in this shift towards inquiry? I am not the best at design but teaching through inquiry has really played into my hand. Because Inquiry is a lot about student learning so is classroom design. My classroom is built around my students. My walls are their work, my tables are just that tables. Students are free to work where ever they want. This is so important. I think that for Inquiry to really happen schedules have to be in place for it to happen. This comes through admin and staff working together to really create something special for the students. inquiry cannot happen in one period blocks of time. Their needs to be a lot of creativity, planning and thinking on all to make it happen. I have clumped these altogether because I think they go hand in hand; however, the answer is a politically sensitive one. In order to have better questioning and understanding of the curriculum teachers need to know their stuff. Their has been numerous debates over the importance of inquiry and its failures. Where it does fail is when as teachers we do not know enough to help our students learn. We cannot let them just wonder the universe searching for answers. Their needs to be a balance between skill and exploration. I always use the idea of Wayne Gretzky (though I know that this may create debate in itself). Gretzky became great because he had skill and he practise but he also had coaches along the way that shaped and modeled his abilities. They told him when he was doing something wrong at the right times in his career. These coaches had to know their stuff to help him improve. I couldn’t go into the rink and say fix your shot, your pulling to the right because I would have no idea what to do. We also don’t ask a brain surgeon to come and do a heart transplant. He may fully understand what to do but he doesn’t have the right skill for the task. Teachers are the same. To improve our questions and our ability to learn we ourselves have to learn. I recently completed my Masters of Education in the effects of teachers Questions on students learning in Fractions. I had to do a lot of reading, and a lot of learning. It is because of this learning that I was able to hone my craft in asking questions. I am in no way an expert (in my opinion) but through practise, more reading, watching others, learning, and reflecting I am always getting better. This is exactly what teachers need to do. I understand that their is a time factor but it is time well spent. Until we get our profession (all of us) willing to do this than Inquiry will not be fully implemented. I am skipping five for a moment. Teachers need support, that is plain. If the boards and the ministry want inquiry to happen than teacher training is a must. How is this to be done. I think that we really need to rethink our professional development days and staff meetings. Give time for teachers to explore and learn inquiry through inquiry. I always think it is funny when we teach that inquiry is the vest way yet we disseminate information in a lecture style. It contradicts inquiry. With these four critical components our whole school understands what problem solving is, what resources to use, and some critical questions to be asking through the whole process. On a whole our staff does two to three problems a unit for inquiry in math. Our next steps are to continue this and to further implement it. We can take a note of this small study for a bigger picture. Implementation will always be slow the more people you have but through these four steps it can be done. The more conversation the better it becomes. This is a nice way to end this conversation. I believe that the best part of Inquiry is students get a voice. Students feel a part of the classroom, even though you are for the most part deciding what is being taught, students are exploring at their pace, with their words and with their ideas. With Inquiry they are the lesson. Its their questions, their answers and their opinions that drive the discussions and learning. Sure you had the big idea in place, maybe the activity but it always comes down to their learning. Be willing to give into this and amazing things will happen. Once again, these are only my opinions and as Inquiry continues to evolve so will my thoughts. I love hearing from people so if you have any ideas please share. Love to hear them. I recently came upon a post by my friend Aviva (@avivaloca). In her blog (http://bit.ly/1zZi78y) she was reflecting on teaching through inquiry. I started to respond in her comments but was thinking of so much more to write. I believe a lot in Inquiry and I think that it has a lot of potential to really impact our students. I also know that there is a lot of misconceptions around inquiry or a feeling that because of it students are falling behind. I want to first start of by stating that for me Inquiry is probably the best way to teach. If done right it can offer a perfect balance between students choice and teacher taught skills. I know in other blog posts I have mentioned how I go about teaching through inquiry but will attempt a short intro here. In my classroom students solve problems or sort through provocations that all them to explore as a individual, group or class. As students are exploring, questions and observing I am conferencing with individual students. Every now and then we stop and ask questions to the whole class. This allows the learning to be shared and focused. At the end of the exploration period (which can be longer then a period or day) we have a consolidation time where we bring our findings to the class. During this time I am focusing the talk to the big ideas that I saw transpire. As I mentioned this blog post is in response to Aviva’s questions. Now Aviva had a lot of questions and for the sake of the length of a blog post I have split the conversation into two groups. The first centers on planning needs and part two will center on the teaching needs. Though in all truth they go hand in hand. How does this impact on long-range planning (i.e., we need to teach all of the overall expectations, but could student wonders impact on how and when this information is taught)? How does this impact on the use of tests and culminating tasks? How “formal” do assessment tasks need to be for students to show us what they know? How does this impact on the marking? Will a focus on inquiry also eventually lead to a provincial change in evaluation methods (i.e., moving from grades and percents to specific anecdotal comments, such as the ones used on the Full-Day Kindergarten Report Cards)? How does this impact on homework? How do we inspire students to want to learn outside of school, and how do we show parents the value in learning that does not rely on a textbook or black line masters? I believe that you still need to have a set of long range plans. In Ontario we have a curriculum that must be followed. Even though students are exploring and observing, their is still is guidance that a teacher must follow. Not only this but having long range plans allows me to keep in mind what subjects, themes and big ideas I need to blend in. I also post these long range plans for my parents to follow. If they want to help at home (which I highly encourage) they know roughly what subject matter we will be focusing on. Now even though I have long range plans they often focus on curriculum big ideas, problems and often have questions that I will be asking the kids. My plans are not focused on the specific expectations because I know that through problem solving and inquiry these will be covered. I also find that my problems cover many various expectations not just the subject that I am teaching. However, without my long range plans I wouldn’t be able to make those connections or be able to comment/ communicate to parents what is happening in the classroom. This for me has undergone the most transformation in my teaching career. At first I was yeah we need tests or their has to be some sort of culminating task but to be honest as the years have progressed I have used less and less of these tasks for assessments. As students are working on problems I am always tweeting, conferencing and recording notes. I have found that I actually understand my students more than I ever did. So much so that one day I was giving a test and as I looked around I knew what their answers would be before I gave it to them. I also new what their next steps would be, what errors they would be making or what questions to ask them. This made me think first was this assessment necessary and why was I doing this. Instead of wasting two periods on a test I now make it a learning experience and use the time to discuss the big ideas with my class. Now all students benefit from the assessment not just the ones who got it right. In addition, I know that most test or tasks were designed for parents to know what their child is doing in class. I now assess pretty much everything (just in different ways). My notes are sent to parents through duo-tangs, notebooks or rubrics. With GAFE my students and parents can see comments in real time for writing. It is this formative feedback that is the most rich and engaging. In fact if my students or parents don’t know what mark they are getting on their report card than I haven’t really done my job right or communicated effectively. Marking is way different. Before marks where from tests or assignments. Now I find that everything to some degree is marked; definitely commented on. I now have a general assessment form that I use through GAFE, this allows me to have a record of my conferences and comments throughout the year. I also believe that assessment belongs in the hand of the students. Through constant conferencing and talking my students should know where they are on the landscapes and trajectories that we make together. They should know their next steps and goals. We also do a lot of goal setting and planning to help them learn how to grow. This again helps with parents because the students are always thinking about their learning and talking about it. I also have been using social media like twitter and storify to allow parents into our classroom. By asking questions within the storify it helps parents connect with their child’s understanding of the topics learned in class. I have never been a fan of homework. I don’t know if this stems from my own experience with it or not but I find that this (in a traditional sense) does nothing for students learning. Now don’t get me wrong, practise is important. You can never be great at anything without practise. But doing mind numbing and senseless worksheets is not practise. In addition, in elementary much of the research shows that it doesn’t help the students in fact it often hinders their learning. Successful students (in my teaching experience) are the ones that have had experiences to draw upon. They are the ones that have been read to as a child, done things with their families, play outside or play games. Their is a lot of learning in the family model. Students also have their own passions and interests that they should be encouraged to pursue. In my classroom, reading is the homework. In fact its not really considered homework as this is a must for success. I also give one math problem a week and encourage my students to play math games from our bin. I also have Youtube videos for the students to watch and learn from. This helps with the teaching when they come back to the classroom. I cannot cover everything in the curriculum on my own, many things may be glanced over or skimmed because it is not where the class needs to be. Please encourage you child to try and learn this on their own and bring it back for the class to learn. I always give opportunities for students to present their learning and be the teachers in the classroom. I also mention that as Parents they have every right to teach anything that they want to their students and I encourage it. Its these experiences that will help them grow and learn together. All I ask is that they have a growth mindset and not think that what they are learning is the only way. This also goes for my teaching too. As inquiry continues students start to learn how to critically think and evaluate the information given to them. This is such an important skill to have. This brings me to the end of the first part of Aviva’s questions. This of course is only my thoughts and in no way is it a final answer. That is the best part of inquiry learning, it takes a community of learners to bring about understanding. I would love to know your thoughts, as I am always rethinking Inquiry in the classroom. Please share them with your own blog or comment below love to hear them. And stay tune for part 2, which will probably be posted shortly after this.